Jan and I had an immediate connection and I very much enjoyed our email conversations over the next few weeks as I designed him a new tattoo. His knowledge of symbolism and mythology rivaled my own. Jan sent me all his information, his affinities to certain symbols and numbers and the reasons why. He was so fantastic to work with. I’ve said it before, it is one thing to paint something for someone that they put on their wall, and perhaps “out grow” over the years. It is another thing to design something that a person embeds upon himself permanently. Some of the things I added to this tattoo, from our conversations, included 7 rays of fire in the turtle’s head (for Jan’s affinity to the number 7 and the fire symbol). I used a bear claw print in the fin of the turtle (a symbol and totem of good luck in the native culture) since Jan told me his totem animal is the Grizzly Bear. I also added an Owl at the top of his life path since Jan also explained to me how his guardian symbol is the Owl. Lastly, I threw in a few Koru symbols (swirling ferns) as one of the photos Jan sent me of himself was from an trip he had taken to New Zealand. 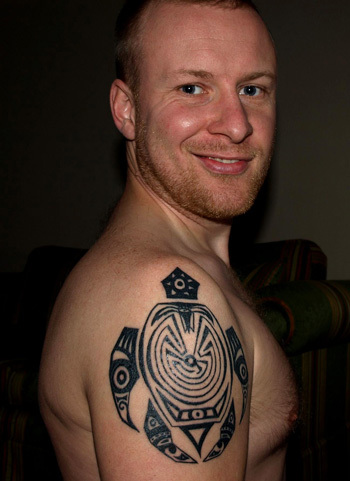 I too had an amazing / life altering trip to NZ, so I added the Koru which symbolizes spirituality and new beginnings. I think Jan also holds the record for the fastest turn around time from the time he received my final image, and when he had the tattoo done (just a couple of weeks). In December, Jan emailed me a photo of the finished product.